What can I send to United Arab Emirates? What items are restricted? Shipments being sent to the UAE for non-residents who do not hold a UAE Passport, Residence or Employment Visa should not exceed a declared value of 1000 AED ( £175 / 200€ / $250 USD) to eligible for duty free clearance. Shipments exceeding a value of 1000 AED will require a copy of the named receiver's passport, and their Residence or Employment Visa if they are a non UAE passport holder. See our UAE destination page for more information. The United Arab Emirates is a fantastic country to visit, whether it’s for a quick stopover, for a big business meeting in Dubai, for a holiday by the beach in Abu Dhabi, or for a new place to call home. If you want to take part in your favourite sporting activities while you are there, you can do so using your own equipment. Send My Bag can get your awkward or oversized luggage to you wherever you’re staying in the UAE. If you’ve over-packed or don’t want the hassle of carrying and checking in a heavy suitcase, Send My Bag can take care of it for you. We can pick up your problem luggage from your front door and deliver it right to your accommodation at your destination. UAE is an increasingly popular choice for students looking to study abroad. Send My Bag can help students relocate to UAE, allowing them to bring all the books, equipment and clothing that they need. You can easily send your luggage and boxes to UAE with Send My Bag. This way you will save yourself a lot of stress and hassle by avoiding the need to wait in line at bag drop or luggage carousels. If you are moving permanently to UAE, sending your luggage means you can bring lots of your favourite things with you to make you feel at home there. With Send My Bag taking care of your luggage, you can focus on discovering your new environment. To read more about sending luggage to UAE, visit our ‘How it works’ page, or our ‘FAQs’. There are around 20 golf courses in UAE, so you can easily enjoy a few rounds of golf when you are there. Some of the best courses include Yas Links, Emirates and Abu Dhabi. You can enjoy your game of golf using your own clubs, rather than hiring clubs when you arrive, by sending them to UAE with Send My Bag. You can also avoid oversized baggage fees from your airlines by sending your golf clubs. See further information on how to send golf clubs with Send My Bag, including how best to package your golf clubs. If you find the right location, cycling in UAE can be very enjoyable. You can send your bicycle with Send My Bag, having it arrive at your hotel, ready for you to pick up and take out your chosen cycling location. Sending your bike to UAE is much easier than checking it into the hold of your plane. You will avoid oversized baggage fees and won't have to carry the bike to and from the airport. Your bike will need to be taken apart and properly packaged before being sent to UAE. Check out our information on bike shipping to learn more. If you are relocating to UAE permanently, you will have to look into international removals to UAE in order to move your possessions. If you go for this option, make sure all your items are carefully packaged so that they arrive in one piece. Use suitable packaging for your items and tape everything up well. UAE has plenty of top-notch local universities, and many western universities have also set up campuses there, such as MIT, NYU and Paris-Sorbonne. Why not study in UAE and experience another culture? If moving to UAE to study you will need to bring lots of items with you, such as your course textbooks and many other items, like novels, clothes and photos. Read more about student shipping on our student removals page and find out how to receive your student discount. You can ask a friend or family member to send a parcel to UAE containing anything you have left at home. It couldn’t be easier to send a parcel to UAE with Send My Bag. Just make sure you choose a sturdy box and tape it up well so nothing gets damaged in transit. Find out more about sending a parcel and learn what you can send with Send My Bag and how to package your items. If you need to send more than parcels, baggage and luggage to UAE, you could look into the following options for shipping items internationally, especially if you need to send large items like a desk or dining table. You could opt for air freight when sending a large item like a sofa or an ottoman to UAE. This kind of service normally takes around one to two days. This is typically quicker than sea freight shipping, but usually more expensive. Note that you will probably also have to pay a customs agent to handle customs clearance for you. Another cost is getting your items to and from the airport. The price could, therefore, quickly mount up. If you send internationally by air freight to UAE your items will likely arrive at one of the major airports, such as Abu Dhabi Airport, Dubai Airport or Fujairah Airport. You could go instead for sea freight or container shipping to get your possessions to UAE. Large bulky items, such as a snooker table or armchair, are loaded into containers, which are, in turn, placed onto cargo ships. You will have to wait a number of weeks for your items to arrive, though it is normally cheaper than air freight. However, you will still need to pay for the services of a customs agent and will need to arrange how to get your items to and from the ports. This means the cost could be more than expected. When using container shipping to UAE, your items will most likely arrive by ship at one of the major sea ports, such as Sharjah, Fujairah or Dubai. Customers will be required to provide a passport image in the name of the receiver on their order to assist with customs clearance. In addition, shipments valued over 1000 AED will require a copy of the Residence or Employment Visa of the receiver to gain relief from duty and taxes. Documents in the shipper's name will be rejected by customs. If a Residence or Employment Visa is required for clearance, this will be requested by Send My Bag upon the shipment's arrival in the UAE. Storage fees may also be applicable if additional information is not provided to Send My Bag or our courier partners in a timely matter. Customers who do not hold a Residence / Employment Visa, or UAE Passport are advised to ensure they do not declare a value exceeding 1000 AED in order to be eligible for duty free clearance. Shipments of Personal Effects may also incur a clearance fee of 70-100 AED depending on the service used, which is paid upon delivery. No items will be processed on Fridays but deliveries can take place on Sundays. Because most countries allow a free personal effects allowance, the majority of shipments with Send My Bag will not be stopped by customs. Personal effects are usually defined as used items that have been in the sender’s possession for at least 6 months. If UAE customs officials find brand new items in your shipment you may be charged applicable taxes and duties. This is something to keep in mind if sending gifts in your shipment. Before sending gifts to UAE, please make sure you are aware of any duties you will have to pay and attach all necessary documentation to your shipment. To demonstrate that you are sending only personal effects, you will need to write a short packing list, written as follows: "2 x Pair Suede Shoes x 1 x Woollen Blazer, 4 x Jeans, 3 x Cotton Dress", etc., rather than as "10 x Used Clothing". As customs processes and allowances differ according to country, we advise all travellers to take 5 minutes to check how their personal circumstances and what they are sending will be assessed under UAE customs regulations. 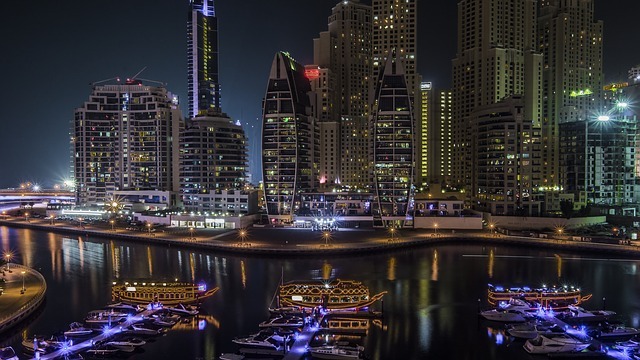 The major tourist destinations of the UAE are the more cosmopolitan coastal ports, such as Sharjah and Dubai, where tourists flock to find the delights of ancient souks and bustling malls. Aside from shopping, one of the main focuses for tourists is the beach. But if you don’t fancy lying around and burning up in the midday sun, try hiring a yacht or have a go at scuba diving or snorkelling. Further inland, there are plenty of things to keep you occupied, from indoor sky diving experiences to golfing and shooting in Sharjah or even skiing at the indoor ski resort in Dubai.